New den furniture, rug, throw pillows 2016. New floors in living area and bedrooms 2014. Our villa has been totally renovated as of 2009. New floors through out living areas and bedrooms 2009, completely renovated bath with tumbled marble accents 2007, master bath w/slate accents 2009, completely renovated kitchen including lighting, tile floors, tumbled marble and new cabinets 2007. All new furniture in 2005 and 2006,living room complete with new 37 in HD LCD Flat screen TV(2009) and DVD, dining room, King and Queen bedroom with LCD TVs 2009, Queen with new mattress, new Ralph Lauren luxury bedding for your comfort. New lighting/ceiling fans in all BR 2009, new windows and doors 2009, plantation shutters 2009, pictures - everything you could want in a vacation RENTAL AND, *** BEST OF ALL ITS JUST 75 YARDS TO THE BEACH ***. Conveniently located to all of the island amenities and the beach, our Captain John Fripp Villa is perfect for your family's summer vacation. This ocean view condominium is just 75 yards from the ocean and is conveniently located next door to the Beach Club, two pools, shopping, Racquet Club, newly renovated Fitness Center, bike rentals, and the Lil' Dipper where you can pickup your pizza or favorite flavor of ice cream. Our ocean view villa is located on Fripp’s best beach in the ONLY area on Fripp Island with beach available at all tides. You can walk out to the ocean and access the beach using the private sidewalk and beach access. Enjoy the ocean view and breeze while sitting on the covered patio or grilling your favorite foods. Our villa is perfect for a family or group of friends. Each of the two master bedrooms enjoys a private bath, one with a king and one with a queen-sized bed. The third bedroom contains bunk beds with a double on the bottom and a twin on the top. 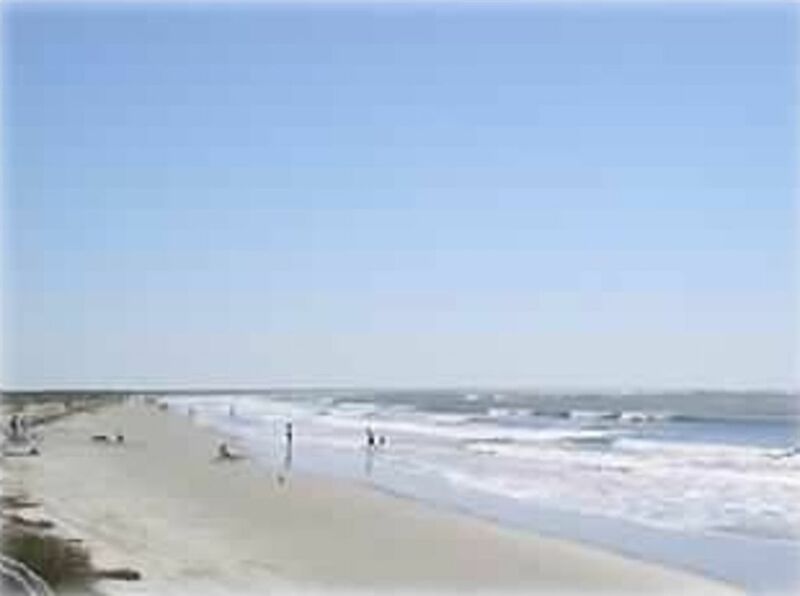 Fripp Island is the South's best-kept secret! Located only 15 nautical miles north of Hilton Head, Fripp is a three and one-half-mile-long, secluded, private island, designated as a nature preserve. Just a short drive to some of our country's most historic sites in Beaufort, Charleston, and Savannah, you will soon see why this area has been chosen as the location for top Hollywood movies, including Forest Gump, Prince of Tides, The Big Chill, The Great Santini, and Jungle Book. You can 'kick back and relax' or choose from a variety of active sports: fishing, golfing at George Cobb's Ocean Point Golf Course or Davis Love's Ocean Creek Golf Course (recently awarded four and one-half stars by Golf Digest Magazine), or play tennis on one of ten Fast-Dry or hard courts. An educational Nature Center is located on the island for kids of all ages to enjoy. Camp Fripp and Wee Links Golf are a must for the kids. Two Fripp Island amenity cards are included with a 7 night rental. Additional cards may be purchased at the Fripp Island club member price in advance of stay. In addition the Resort offers 3 night/4 day cards and monthly cards which may be purchased through the owner in advance of stay. Our condo is located center island just steps from the beach with an ocean view from the living, dining, and patio. We're right next door to many of the major island amenities - pools, Beach Club restaurant, Island Supreme pizza/ice cream, Fripp Ship shop, and tennis courts. Our condo is completely stocked with linens and everything you need to cook a meal on the outdoor Weber grill. - just bring your beach towels and you're all set. Our condo is truly just a few steps to the beach. Has it's own private walkway to ocean crossover and boardwalk to the beach. Beautiful grassy courtyard area where the kid's can play and the deer walk right up to your patio. Two Fripp Island amenity cards are included with a 7 night rental. Additional cards may be purchased at the Fripp Island club member price in advance of stay. The resort offers 3 night/4 day cards which may be purchased through the owner in advance of stay. 75 yards from the Beach. Covered Patio and outdoor patio table and seating. We really enjoyed our stay, just wish we could have stayed longer. The condo was very neat and clean, and was well appointed. Loved our walks on the beach and our daily visits from the deer. Hope to be able to visit again. We stayed here for a few days in March. The place was perfect for us. My only complaint is that we had to buy amenity cards to access restaurants and pools. This was because we weren't staying an entire week. Fripp is a beautiful place and I definitely hope to come back some day. A great escape from the northern winter! Beautiful, quiet location. The property was just as described. Comfortable beds. fresh linens and plenty of towels. The kitchen is well-equipped and offered all we needed for basic cooking. Such close access to the beach was a special treat for us city folks. The living and dining rooms were bright with daylight and comfortable. The security deposit was refunded promptly. My only suggestion: the area rug in the living room would likely benefit from a deep shampoo. Thank You Deborah for the use of your property. We really enjoyed it. A great place for a getaway! Great, central location. Very comfortable condo with a well-supplied, modern kitchen. The owners were very responsive and helpful. My husband and I took our 6month old for her first trip to the beach this October. While the weather was windy and a little chilly we found this condo to be cozy and well cared for. We were really impressed with Fripp island and it's occupants. You couldn't ask for nicer people. We will definitely come back! Great family getaway just a few steps from the beach! Two of our kids had gone with friends to Fripp Island so they begged us to go. We decided to take a family trip. The condo was perfect for the 5 of us. Super close to the beach! I enjoyed having coffee each morning on the patio. A few mornings, the deer would come up and say hello. It is located just next door to the resort's food court and pools (amenity cards required). The condo owner was quick to respond if we had a question. We ate breakfast and lunch at the condo and had everything we needed in the kitchen. I would consider renting this condo again if we return to Fripp. 7 day rental rates include cleaning fee, and 2 free amenity cards. Stays of less than 7 nights and monthly stay require an additional $95 cleaning fee and amenity cards are not included in the rate. Amenity cards may be purchased through the owners and price is set by Fripp Island Resort by season. Rates do not include tax. Rates confirmed at time of reservation. Early, Prime, and Late summer season is on a Saturday - Saturday basis only. Some exceptions in late summer season may apply.